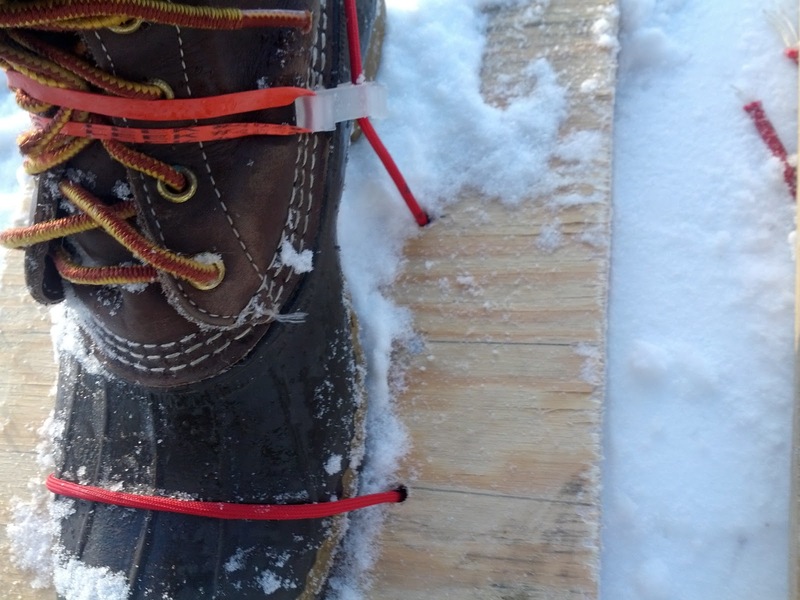 Susannah was talking about snow-shoeing today, and I got the idea that it might be neat to try to make some. From a pure practicality standpoint, at worst, it would be nice to have something to help the occasional trek out to the storage shed when the need arises. At best, I might actually try doing some real snow shoeing (in a place where I won't be judged by some yuppie with their $300 designer L.L. Bean, carbon fiber jobbies). I decided to use any of the million scrap pieces of wood in the garage. I had an idea for a design in mind, but I did a quick search of the internets just to see what the current knowledge was. 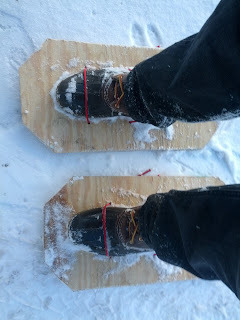 I was able to find a single design in which someone did something close to what I had in mind (employing plywood). Decided I would start with that same basic idea and see if I could make any improvements necessary. The starting design was pretty good - took about 30 minutes to make (which was appropriate for my attention span). I then made two adjustments to the binding design, one was to move the rear set of holes 2 inches further back, to increase the longitudinal stability when taking a step. 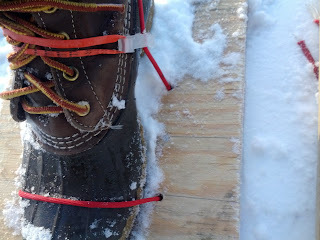 The other was to add clips and a rubber band across the instep (front part of the boot) to fasten the rear binding to the boot. This worked like a charm and made it a breeze to don and remove the snow shoes. You just step in, and place the rubber band across the clips. Remove the rubber band and step out when you're done. I took a quick trek around the house. It took a few steps to get used to them, but soon enough they felt very natural. The shoes did sink into the snow about 5 inches, which I found to be acceptable. Our yard has about 18-20" of snow cover depth, so walk-ability was definitely improved. I found it was best to drag them a little when taking a step.